A major challenge for the meat and seafood industries continues to be that of pro- ducing high-quality, wholesome products. Consumers' demand for reduced-fat, low-fat, and fat-free meats (red meat, poultry, and seafood) with acceptable flavor, texture, and other sensory characteristics or those similar to typical, traditional high-fat meats has im- parted further urgency to rising to this challenge. Consequently, meat scientists strive to develop different antemortem strategies as well as to improve on existing postmortem processing technologies in order to meet this consumer demand. While the microbiological quality of meat, meat products, and seafoods is important from a food safety standpoint, it is the physicochemical attributes and the interactions of the various chemical components of muscle and ingredients which directly influence the product palatability and consumer acceptability. 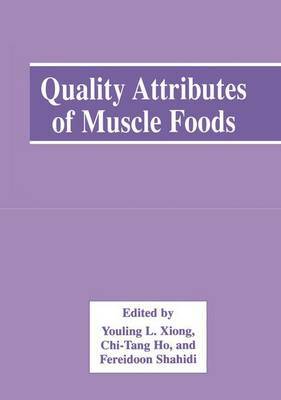 Virtually every step in production and processing, including animal dietary regime, antemortem stress conditions, postmortem handling, product formulation, temperature of processing, packaging, and storage, affects the quality attributes of muscle foods.